From a concept album loosely based on the American Civil War (2010's The Monitor) to the sprawling 29-song, 93-minute rock opera about mental illness (2015's The Most Lamentable Tragedy), Patrick Stickles of Titus Andronicus has never been one to back down from an ambitious challenge. Now, Stickles has flipped his ferocious punk-rock band temporarily into a duo for their first-ever "acoustic" tour (Stickles played electric guitar for the entire set), and brought it to Toronto's Great Hall for a bizarre and wonderful performance with some peculiar surprises. Keyboardist Alex Molini came on stage first and began the recognizable introduction of the gracious "To Old Friends and New" before Stickles burst from behind the red curtain, mic in hand, like an elegant ballroom singer. For those who had no idea, it was clear that this show was not going to be the loud, unabashed rock concert some may have been expecting. Instead, this Titus Andronicus show saw Stickles and Molini play from the band's recently released mid-tempo, stripped-down fifth album, A Productive Cough, as well as some reimagined versions of past work. While A Productive Cough features upwards of 21 contributors to its dusty barroom numbers, as a duo, with Stickles on electric guitar and Molini on keys, the new songs were performed in an even more bare-bones arrangement. The two made their way through the meandering lead single, "Number One (In New York)," with Stickles' poetic rant becoming hypnotic in a way that made some concert-goers shush the handful who were talking loudly — likely a first-ever occurrence at a Titus Andronicus show — during the eight-minute song. A Productive Cough's rollicking highlight "Above the Bodega (Local Business)" got the crowd moving a bit, singing along to Stickles' observational prose about keeping a private life in New York City ("But I can't keep a secret from the guy at the store downstairs"). A bemused Stickles reinforced, "Hey, I like it when you sing! This is the Titus Andronicus acoustic tour — there is no hidden drum set behind this curtain so there's a lot of sonic real estate available for you to sing!" The crowd took his advice to heart when the band played "Upon Viewing Oregon's Landscape with the Flood of Detritus" from 2012's Local Business, followed by "No Future Part I" from their debut, The Airing of Grievances. Even without a full band to lean on, Stickles maintained his ragged punk ethos by rambling and yelling into the microphone while roughly strumming his guitar. His humour was also in full force, as they played fan favourite "Theme from 'Cheers'" from The Monitor and cheekily followed it with a cover of the actual theme from the '80s sitcom. After, Stickles walked to the back of the venue, found a comfortable seat on the bar counter and wowed the crowd with an astonishing cover of "Lilac Wine," belting out the song's soaring highs with unanticipated beauty and clean vocal refinement not typically found in Titus Andronicus's sound. Stickles then serenaded the audience with "Better Off Without a Wife" by Tom Waits before ordering a drink, casually tipping the bartender and coolly walking back to the stage. Not to be outdone by the curveball antics of Stickles, during "Four Score and Seven," the audience formed a small mosh pit — another possible first for a band featuring only a guitar and keyboard — in time for the climactic yelling-in-unison, anthemic ending of "it's still us against them and they're winning!" The passionate fans near the front were clearly itching for one last sing-along and they got it, with a tamer version of "Dimed Out," to close out the hour-and-three-quarters set. 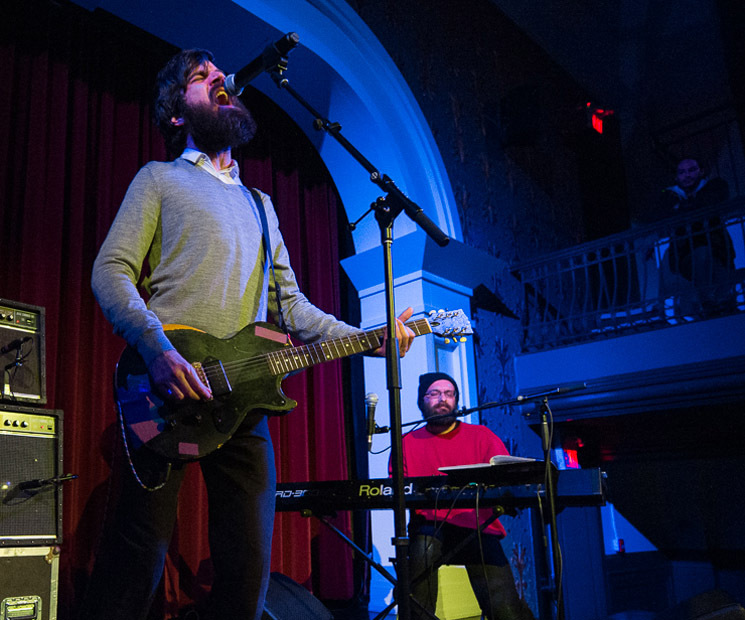 For this simplified live rendition of Titus Andronicus, Stickles' restless storytelling and rich lyrical vocabulary were underscored without the surly intensity of a full band. The deliverance was in the form of laid-back rock waltzes performed by a duo, an artistic choice that was deliberately challenging (and seemingly rewarding in this context) not only for Stickles, but also for diehard fans of the band with certain expectations. Stickles is dealing with being a little bit older in the punk rock scene, holding on to his wordsmith credibility and wry existential outlooks on everyday life while questioning what it really means to be a punk rock musician.